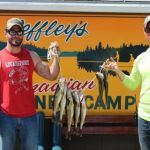 As the only non-road accessible camp on Wabaskang Lake-Peffley's Wilderness Camp provides our guests the best of both worlds: A remote fishing destination on lakes proven to be quality fisheries, but without the cost and restrictions (weight) of a fly-in trip. Not to sacrifice your comfort, our cabins are modern with hot and cold running water, flush toilets and showers. 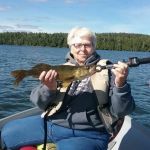 Our housekeeping packages are affordable and with six other lakes nearby to portage into, your fishing and adventure opportunities are endless. Although we can arrange day fly-in trips for your party, when you experience our exclusive walk-to Catch and Release only lake-you may just change your mind about wanting to pay for a fly-in! 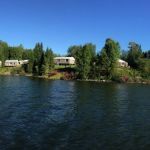 During your stay at Peffley's Canadian Wilderness Camp, we are confident you will enjoy the outstanding fishing, the friendly atmosphere of the camp, the cleanliness of the camp, equipment and accommodations, and of course the scenery, wildlife and serenity of the Canadian wilderness. 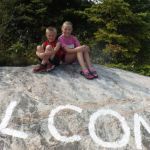 Come once, and discover why we have so many guests who have returned to camp for 10+ years! Wabaskang - The lake that fishes small! With 15,000 acres of water and 105 miles of shoreline, Wabaskang Lake sounds like a pretty large body of water. Actually compared to many lakes in our region it is quite small AND more importantly fishes like it. Wabaskang is "divided" into five very manageable sections and our guests are very successful catching lot's of fish in the two sections that are accessible from our camp in 15 minutes or less! We don't offer guide service out of our camp-because we simply don't need to! Can the competition say that? 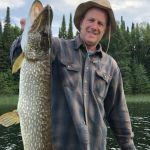 With nearly 20 years experience fishing Wabaskang Lake-I will personally mark a lake map for your group and give you a complete orientation on how, when and where to put fish in your boat starting Day One. A small (8 guest cabins), very friendly camp with NO campgrounds in a remote environment. A meticulously clean, comfortable lakefront cabin with indoor plumbing. Professional and courteous service from the owners and staff at all times. 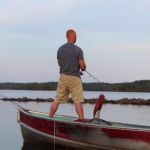 Quality multi-species fisheries that will provide hours of fun catching fish very close to camp. High quality marine equipment including new or nearly new Yamaha four-stroke outboard motors and high-back cushioned swivel seats from Cabelas. Remote portage trips available - FREE OF ADDITIONAL CHARGES. Owner's who are on-site and maintain a vested interest in making your trip successful in every regard. Screened and extremely clean fish cleaning house with free freezer service. Bringing your own boat?-We provide free launching and dockage and up to 15 gallons of gas in your package price. At Peffley's Wilderness Camp, we don't do A LOT of hunts--JUST quality ones. Many of our hunters return to hunt with us again. Peffley's Canadian Wilderness Camp has EXCLUSIVE hunting rights to over 36 square miles of Bear Management Area around Wabaskang Lake for our hunters. Our hunters access their baited stands by boat (included in their hunting package), therefore they are also able to fish during their weekly stay in camp. As a result, every bear hunt booked is actually a hunt/fish combo if the guest chooses to do both. To get all this for a lot less than you might think --- click here for our rate plans.